Producing documentaries, which have become much more popular and visible on TV, DVD and in theaters in recent years, has never been an undertaking for the faint of heart. And fundraising for such projects is undeniably a challenge. When I last wrote about fundraising for documentaries, in the February 2006 issue of Documentary, there was no recession; in fact, people were feeling pretty flush. And what I said then is all the more true today. Competition is even fiercer, since funders have less cash to award, and there is still not enough money out there--even for the really good projects. People are applying two or three times to some funders out of necessity. Every round is different, with different competitors and panelists. You still need to gird yourself for the long haul and equip yourself for present-day realities. You still need to create a pitch and proposals for your project that sound exciting and relevant, and reflect a thorough knowledge of both the subject and the audiences you are targeting. You also need to design a knock-out community outreach strategy, which many funding sources will expect these days. In other words, you have to learn to be an indefatigable marketing motor for your project. Successful marketing is always about taking a cold, hard look at your project, deciding what its strengths are, and then making the most of them. You need to decide who your target audiences are, given those strengths, and what tools will be most effective in making your case to them. Probably the single most important thing you can do is to learn everything about the landscape--including documentary festivals, markets and pitching forums, along with all the kinds of funders who might be interested in your project. Recent years have seen increasing cultivation of partnerships by film projects with like-minded nonprofit organizations working in areas like environment, health, international aid, literacy, etc. Check out other projects and filmmakers who have experience in this area. Look at the Working Films website, which has a good selection of successful outreach campaigns they have designed and implemented. A recent event in New York City, entitled Story Leads to Action and co-hosted with Chicken & Egg Pictures, focused on a work-in-progress documentary by Beth Davenport and Elizabeth Mandel, Pushing the Elephant, about the reunion of a Congolese girl and her mother, separated by war in Congo. Clips were shown and audience discussion and feedback generated a solid list of strategies to pursue in getting the word and film out to the largest possible audiences. For a trio of completed films slated for broadcast on PBS' POV series--Nicole Opper's Off and Running, Stephanie Wang-Breal's Wo Ai Ni Mommy and Deann Borshay Liem's In the Matter of Cha Jung Hee--Working Films organized a summit for films about multicultural and trans-racial adoption. The objective was to develop an extensive public awareness campaign to leverage the national broadcasts, engage key constituencies and deepen understanding of issues facing adoptive families, particularly after they have completed the adoption process. There is also a lot of experience and information available now about fundraising strategies like hosting events, organizing house parties and setting up screenings for potential partners. Working Films has a long list of links to great resources. You will find workshops on every aspect of fundraising, distribution and outreach available all over the country. Make use of these-and then incorporate plans for the ones that will work for you into your production plan. By all means, get the newest version of Shaking the Money Tree, by indefatigable fundraising guru Morrie Warshawski; it has terrific essays by several indie documentarians that are all must-reads. It is not enough anymore to simply make a film and hand it over to a distribution company. You need to plan for fundraising, production, distribution and outreach from the beginning. Check out Take Part, an independent online community that connects its members directly to the issues that inspire them to engage, take action and contribute. Its team of editors, writers and researchers curate and deliver actions in context with in-depth primers to the social, environmental, political and cultural issues of our day. It is a good way to find out what groups and organizations are committed to specific issues and might be potential partners for you. The Channel 4 BRITDOC Foundation, based in London, is pursuing a very interesting and successful social entrepreneurship model for documentary financing. Look at the site and see how it pursues its goal of cultivating a swath of new partners for documentary. That will often mean partners who are looking for something beyond profit. One example is Rupert Murray's The End of the Line, about the depletion of the world's fish stocks, which has raised £1 million from NGOs and Foundations. BRITDOC Foundation director Beadie Finzi points out, "The backers' ambitions are not financial; their aim is to bring about a change in world policy on over-fishing." Whether you are going to a pitch forum, sending out letters of inquiry or submitting proposals, you need to plan those endeavors with a clear sense of the interests of your audience. Make sure to research who attends the pitch forums, focusing on the organizations you'd like to approach for partnerships, and do the same with any funding source. They all want to hear in clear and concise language what your project is about, why you have the right team to do it, why it is important right now and how you will get from a good idea to a strong film. They need to know all of this in concrete detail: information about the topic, the people involved, the stylistic approach, the work plan, the timetable, a fundraising strategy and a distribution and marketing strategy. A good approach, if it works for your topic, is to hook it to an anniversary of an event or person or organization. If you are addressing historical issues or events, make the parallels with the present explicit and exciting. And avoid anything that sounds like hype; it rarely works. Be accurate, enthusiastic, full of conviction--and be a realist. Building a website is an essential tool for fundraising, as well as distribution and outreach. The Web is a great tool for building awareness of the issues and the film in progress. During fundraising, production and distribution, you can put up images, feature particular issues and/or organizations working with you, get linked to partner organizations, track screenings and festivals and announce the DVD edition. Anything that will bring attention and reach more and different constituencies is good. After all, your funders want their support to be visible and useful over the long term. One of the newer Web-based strategies for raising money is crowd-sourcing through social networking sites--basically a version of what the Obama presidential campaign did with such phenomenal success. A number of sites specifically designed for fundraising will post clips or a work-in-progress, plus your proposal and other information you feel is important. ReelChanges.org reviews all submissions and charges no fees for posting your material; nor does it take a percentage of donations. Projects are organized by topic in order for viewers to find the kinds of work in which they are interested. 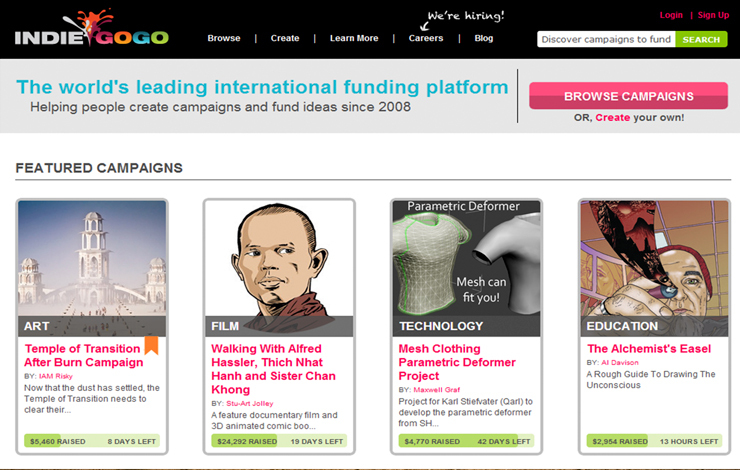 IndieGoGo is another such site for film and video as well as other arts projects. It offers tools for active outreach about your project, which is essential for success with this kind of viral approach. Its Steps for Audience Building is a very useful guide, and it offers many other resources on the site. In February 2010, IndieGoGo produced a webinar on crowd-sourcing with an impressive lineup of presenters, and it has partnered with SnagFilms, IFP, the San Francisco International Film Festival and a host of other organizations working with digital technology for fundraising. Make sure to check out the Press section-lots of good ideas there for free. Take a look also at the website for Power to the Pixel, a company dedicated to developing a cross-media movement. Producer Ted Hope gave an impressive presentation at its London forum in October 2009, with a slew of specific proposals. So far, crowd-sourcing has by no means been a goldmine for film fundraising; most projects have raised a few hundred to a few thousand dollars. For now, it is one of many tools to consider as part of your fundraising strategy. So by now you are probably thinking, "How is one person supposed to wear all these hats--ace marketer, Web wizard, producer, fundraiser par excellence?" The truth is, you will need help and you should make sure to budget for some people to work with you on these various tasks. There are many organization-based resources, in print and online, as well as useful workshops. Check with colleagues about what they would recommend. Choose carefully and use whatever contacts and resources you have judiciously. And remember that documentary makers are among the most resourceful people on the planet.